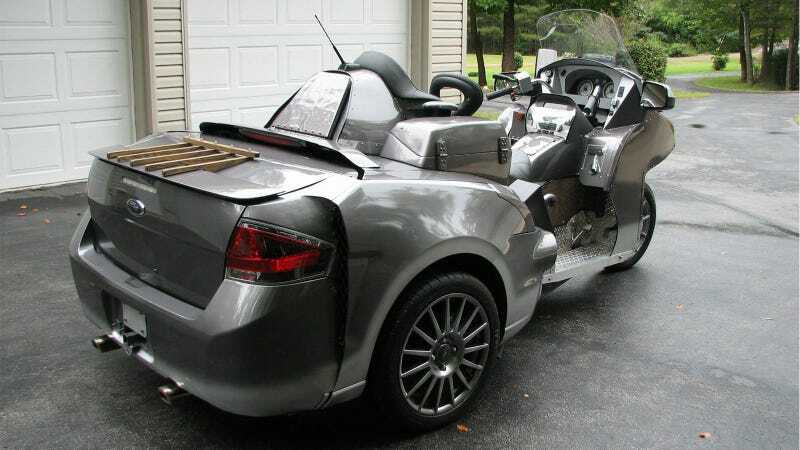 Ever dreamed of having all the freedom of a Ford Focus, while enjoying the sweet system from a Honda Goldwing? I know, the number of times it’s kept me up at night is too many to count too. Well, now you have your chance...if you can outbid me. This beast came in as a tip int he form of an eBay listing, which was then passed to me for its motorcycle (at least half) nature. Being the incredibly responsible journalist that I am, or just out of desperation to find out why someone would do such a thing instead of buying a normal Goldwing trike, I went to email the seller to find out more about the bike WHEN I NOTICED THE SELLER HAD THE SAME USERNAME AS THE TIPSTER. So, GeekJohn, while getting me to write a post about how someone needed to buy this Frankenstein trike almost worked, you’re going to have to work a little harder. I’ll post these pics (because who am I kidding, this thing is weird and fun to think about) but hopefully my Lanesplitting brothers and sisters will stand with me in solidarity and NOT buy this bike UNTIL you have answered every question our little hearts have about what drove you to make this, how you made this, and what it’s like to ride. Deal? Great, go nuts everyone. Have a tip? Send it to tips@jalopnik.com or sean.macdonald@jalopnik.com if it’s motorcycle/powersports related.